Empire actor Jussie Smollett (centre) has been indicted by a grand jury in Chicago. A CHICAGO JURY has indicted American actor Jussie Smollett on 16 felony counts after allegedly lying to police about being the victim of a racist, homophobic hate crime. Police say Smollett – who gained fame on Fox musical drama “Empire” – staged the attack in a bid to gain publicity and a bigger paycheck. Instead, the 36-year-old actor, who is black and gay, has been dropped from the last two episodes of the show’s current season, and his future is now in the hands of the court. He allegedly sent himself a threatening letter and then hired two acquaintances to stage a street attack in downtown Chicago, complete with homophobic and racial slurs, while invoking Donald Trump’s “Make America Great Again” slogan. According to court documents published online by local media, the 16-count indictment lists the specific statutes Smollett violated by telling police he had been attacked when he knew “there was no reasonable ground for believing” that such crimes had occurred. 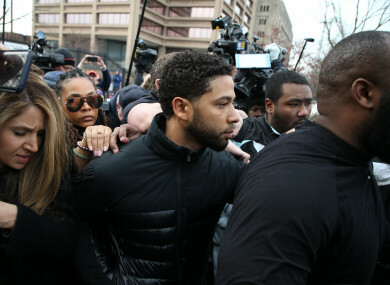 Smollett has denied the allegations against him and in a statement to the media, his attorney Mark Geragos criticised the charges as “prosecutorial overkill”. “Jussie adamantly maintains his innocence even if law enforcement has robbed him of that presumption,” Geragos said. The case has drawn intense national interest with everyone from politicians to celebrities and late night talk show hosts commenting. When asked about the indictment, a Fox spokesman declined to comment. Smollett was released on bond in February. He is next due back in court on 14 March. Comments closed as the case is before the courts. Email “Jussie Smollett charged with 16 felony counts for allegedly lying to police”. Feedback on “Jussie Smollett charged with 16 felony counts for allegedly lying to police”.